Thank you so much for taking the time to fill out the community survey and follow up survey. I appreciate your answers, comments, and questions. You have given me good things to think about and blog about in the coming year. Thank you for your help and encouragement! Much about Cranberry Tea Time will stay the same, and I will continue to write all of my usual types of posts. I was pleasantly surprised to see that each type of post is a favorite of someone! The thing I hope to do differently is to write more often than I typically have in the past. This will allow me to address many of the topics you have requested and to answer the questions you have asked. Of course, blogging frequency will vary based on my energy levels, muscle strength, and brain fog. If you ever have something else you would like me to address, you are welcome to leave it in the comment section or send me an email. 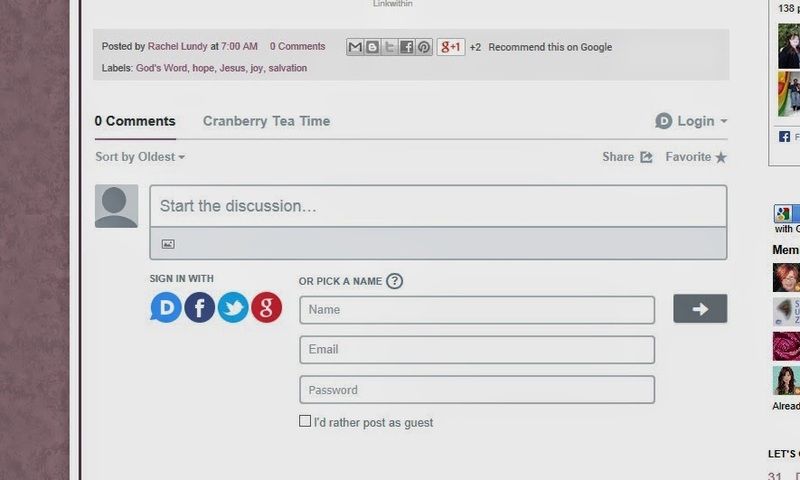 I found out that not everyone has been able to leave a comment on Cranberry Tea Time. I’m so sorry about that! If you don’t like to comment on blogs, that is totally fine. I don’t want you to ever feel pressured to comment here. But for those who want to comment, I want that to be an option for you. I figured out how to fix the issue with Internet Explorer and Disqus, so the comment system should be working properly again in the Internet Explorer web browser. Yay! If the comment box is not below the post, click on “0 Comments” (or whatever the number of comments may be). Once you see the comment box below the post, place your cursor in the box that says, “Start the discussion…” or “Join the discussion…” Type your comment into the box. If you would like, you can log in and post your comment from an account you already have, such as Facebook, Twitter, Disqus, or Google Plus. If posting as a guest, click on the gray button with the white arrow to post your comment. If you have any questions, please feel free to email me. Thanks for being my friends and for meeting me here in this space! It is a blessing to know you, even if only online. I look forward to hearing more on these topics, Rachel. I love the "questions" people asked and I look forward to hearing your answers to them especially (like the one "how do I reach out and encourage other chronically ill friends in practical ways"). Thanks for being so transparent and encouraging, Rachel. It is a blessing to me! hugs! >>How I respond to those who say that I would be healed if I just had enough faith<< Those comments always set my teeth on edge. I am sorry you even have to address them. It is hard to hear comments like that. It always makes me a little bit sick to my stomach. I am praying for wisdom as I address the questions I have been asked, especially this one! Thank you so much for your prayers, Corrine! I will need them in addressing some of these topics!